'What camera should I buy?' That's a question we get asked a lot here at dpreview, and it's a tough one to answer. We use a lot of cameras, from simple point-and-shoot models to professional workhorses, and everything in-between. We review as many of the interesting models as we can, but we can't cover everything, and our reviews are spread out across the year, which can make it hard for you to make buying decisions. 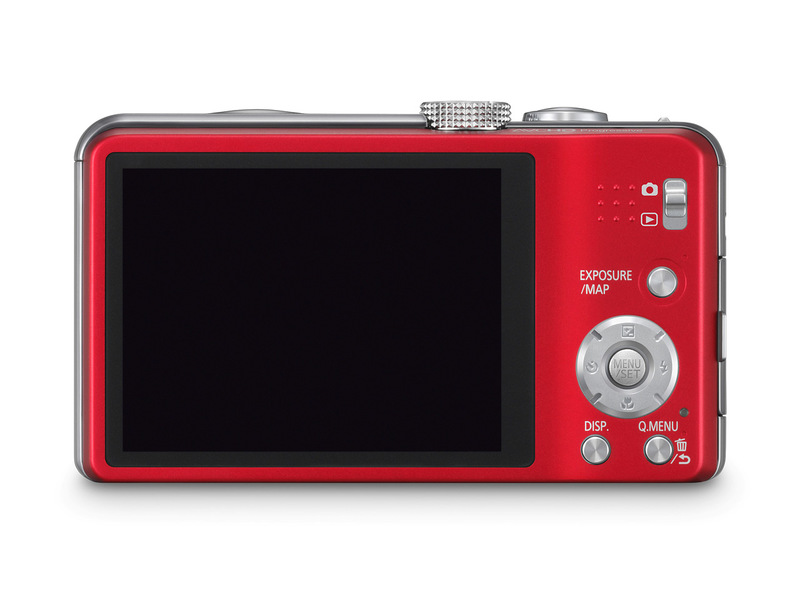 Canon's PowerShot G-series is one of the most iconic lines of digital compact cameras, with the original G1 having debuted back in September 2000. The latest model, the G15, features a 28-140mm zoom with a fast maximum aperture of F1.8-2.8 mated with a Canon-made 12.1MP 1/1.7"-type CMOS sensor. The G15 features an ISO range of 80 to 12,800 and full HD movie recording at a frame-rate of 24 fps, with stereo sound from the built-in microphones. In our testing, we found that the G15's long but impressively bright lens is a real selling point compared to both its predecessor, and indeed most of its competitors. Having a maximum aperture of F1.8-2.8 combined with a useful 28-140mm (equivalent) zoom means that you've got a lot more flexibility in poor light, allowing you to set either a lower ISO sensitivity for cleaner images, or a faster shutter speed to avoid camera-shake or blurring due to subject movement. 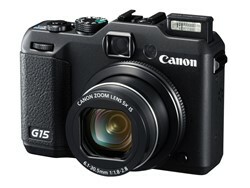 The Canon PowerShot G15 offers an abundance of external controls, and an unusually fast lens, with a maximum aperture of F1.8-2.8 across its 28-140mm (equivalent) zoom. Unlike its predecessor the G12, and some competitive models, the G15's rear display is fixed, not articulated. This makes for a smaller camera than the G12, despite the faster lens. In other respects, the G15 is a very solid performer, firmly in the G-Series tradition. This latest model is fast and responsive in use, offers about as much direct manual control as you could hope for, but isn't as bulky as previous G-series compacts. 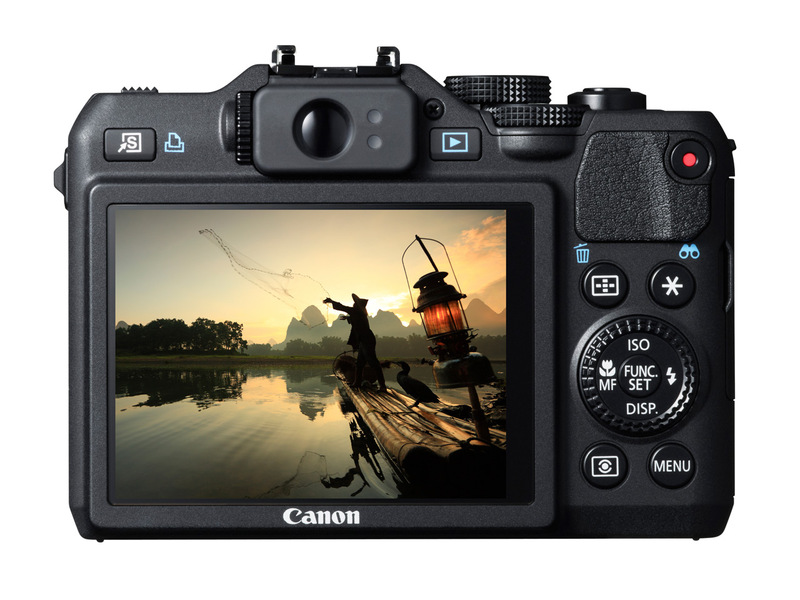 This is partly due to Canon's decision to go with a fixed LCD screen on the rear of the camera, rather than an articulated model. This makes the G15 less flexible when shooting from awkward angles, and when shooting movies, but the increased portability compared to earlier models, and competitors such as Nikon's Coolpix P7700 is very welcome. As far as image quality is concerned, the G15 doesn't disappoint. Detail capture is high at the low end of its ISO sensitivity scale, and its 28-140mm lens is excellent, aided by a very effective image stabilization system that we've found can deliver sharp images at shutter speeds as low as 1/15sec at full zoom. The G15 gets noisier at its higher ISO settings but even at ISO 3200 and 6400, image quality is good enough for small prints or web use, and for critical use, shooting in Raw mode will allow you to get the most out of the camera. All in all, the G15 is a great performer and a pleasure to use. 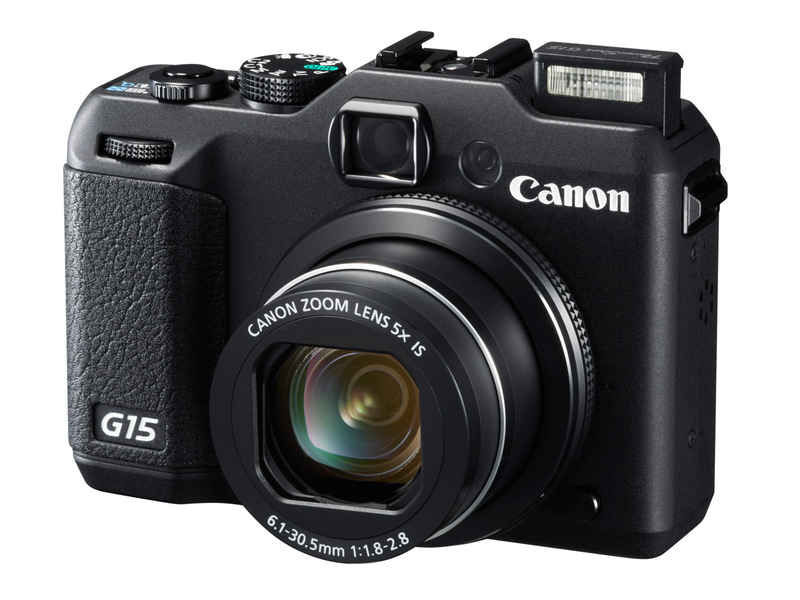 The G15 is highly recommended for anyone that needs a general-purpose compact with lots of manual control that can deliver great quality images. What we like: Excellent 'hands-on' ergonomics in a small, relatively portable body, optical viewfinder can be handy on occasion, very nice image quality, good, responsive operation. What we don't like: We miss the G12's articulated screen, and the lack of any meaningful manual control in video mode will frustrate budding filmmakers. 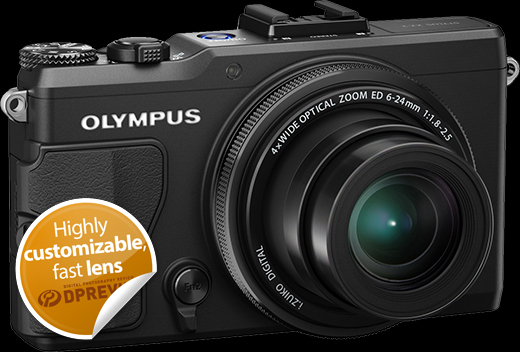 The Olympus XZ-2 is the successor to 2011's XZ-1 and offers a lot of improvements. The XZ-2 incorporates a more modern 12MP CMOS sensor, a screw-in hand grip, tilting touch-screen and a two-mode control dial around the lens. Although the XZ-2 features the same lens as its predecessor, the 28-112mm equivalent range is useful and the F1.8-2.5 maximum aperture is still impressively fast, promising greater versatility in marginal light than some of is competitors. We haven't tested the XZ-2 yet, but we've been using it a lot since it arrived in our office, and in an incredibly busy year for new products, it's one of the cameras that we've been getting most excited about. The XZ-1 was a great camera that earned our gold award when we reviewed it in early 2011, thanks to its excellent lens, high-quality display, effective ergonomics and good image quality. The XZ-2 improves upon the older model in several key ways, and incorporates a lot of the same customization options that we've seen in Olympus' PEN-series interchangeable lens cameras, but leaves the essentials alone. This is the best kind of upgrade. The XZ-2 is reasonably large for a compact camera, but an optional screw-in grip provides a nice solid hand hold. The control dial around the lens is customizable. The rear of the XZ-2 is dominated by a 3 in, 920,000-dot LCD screen. In this view you can also see the mechanical catch for the XZ-2's small built-in flash. Whereas the XZ-1 offered 10MP resolution from a CCD chip, the XZ-2 is built around a 12MP CMOS sensor. Not a huge boost in pixel count, but with the new sensor comes 1080p video, and a wider ISO sensitivity range (up to ISO 12,800). This is probably the same sensor that Nikon uses in its Coolpix P7700. In terms of ergonomics, the XZ-2 has the same dual control-dial interface to its predecessor, but the front control dial can be customized, and boasts a mechanical switch to go between stepped rotation (ideal for inputting exposure changes) and stepless rotation (much nicer for zooming or manual focus). The XZ-2 doesn't offer the OLED display of its predecessor, but its 920,000-dot LCD is one of the best in its class, and now it's tiltable, too. Although we haven't been able to run the XZ-2 through the full gamut of our studio and real-world testing yet, our initial impressions are very positive, both in terms of image quality and operational ergonomics. 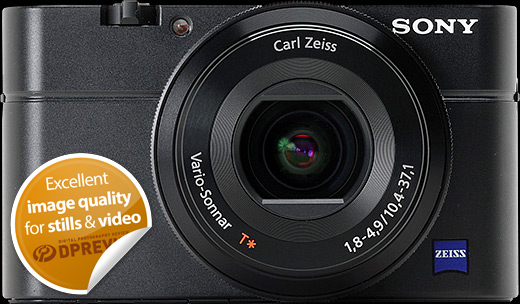 As such, we have no hesitation in recommending the XZ-2 if you're looking for a high-quality compact camera. What we like: Fast lens, proven 12MP CMOS sensor, excellent ergonomics including extensive customization, good image quality (on initial assessment). What we don't like: It's too early to make a definitive judgement, but the XZ-2's lens range isn't as wide as some of its competitors, and it's a little pricey. 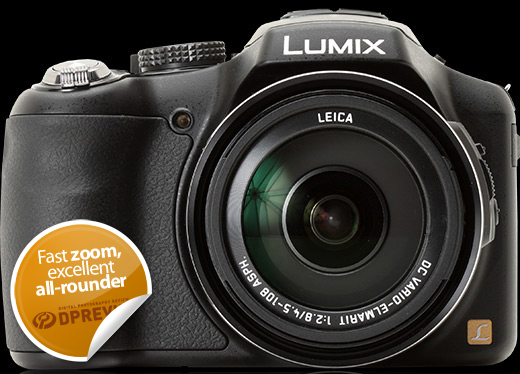 The 12MP Lumix DMC-FZ200 is Panasonic's flagship super-zoom compact digital camera and features a lens with an F2.8 maximum aperture across its entire zoom range of 25-600mm (equivalent). Last year's DMC-FZ150 (which we liked a lot) had an F2.8 - F5.2 lens, so the lens on the FZ200 is a huge improvement, and the extra brightness should make a real difference at long focal lengths and/or in poor light, allowing you to shoot at lower, less noisy ISO settings. Its constant F2.8 aperture makes the FZ200 stand out in its class, especially when it comes to versatility in poor light, or when shooting at the long end of the zoom. That large aperture allows it to offer faster shutter speeds at the same ISO settings as its peers, or use lower sensitivities at the same shutter speeds as the competition. In our testing, we found that in everyday outdoor shooting, the extra brightness of its lens meant that we rarely needed to select the FZ200's highest ISO sensitivity settings. The FZ200's built-in lens covers an equivalent focal span of 25-600mm, with a maximum aperture of F2.8 across the entire range. The FZ200 features a built-in electronic viewfinder, above which are a hotshoe for external flashguns, and a stereo microphone. On the right you'll find an exposure mode dial. This is good news because although the FZ200's image quality is very good at the low end of its ISO sensitivity scale, things get pretty nasty above ISO 1600, as noise really kicks in and the camera's noise-reduction system smears away fine detail more than we'd like. As always though, if you stick to small prints or web display, these issues are much less noticeable. If you're critically-inclined, the FZ200 offers a Raw capture mode - still relatively unusual for this class. Shooting in Raw can make a lot of difference and careful processing will reward you with excellent image quality, particularly between ISO 100-400. As well as offering impressive brightness, the FZ200's 25-600mm lens also offers very good sharpness. Considering the large maximum aperture and ambitious zoom range, we had no complaints about the FZ200's lens for everyday use. There are cameras out there with longer lenses (Nikon's Coolpix P510 is great value, also offers very good image quality and boasts an extraordinary maximum telephoto setting of 1000mm equivalent) but in terms of its feature set, versatility and overall performance, the FZ200 is one of the best super-zooms we've ever used, and highly recommended for anyone that needs the ultimate in flexibility - especially when traveling. What we like: Fast, high-quality F2.8 lens, well thought-out ergonomics for still and video shooting, effective image stabilization, good image quality in JPEG mode and the option to shoot Raw for best results. What we don't like: Image quality drops above ISO 800 in both JPEG and Raw, and ISO 6400 is unusable for all but the least demanding output, some operations can be a little 'laggy', no automatic LCD/EVF switch. 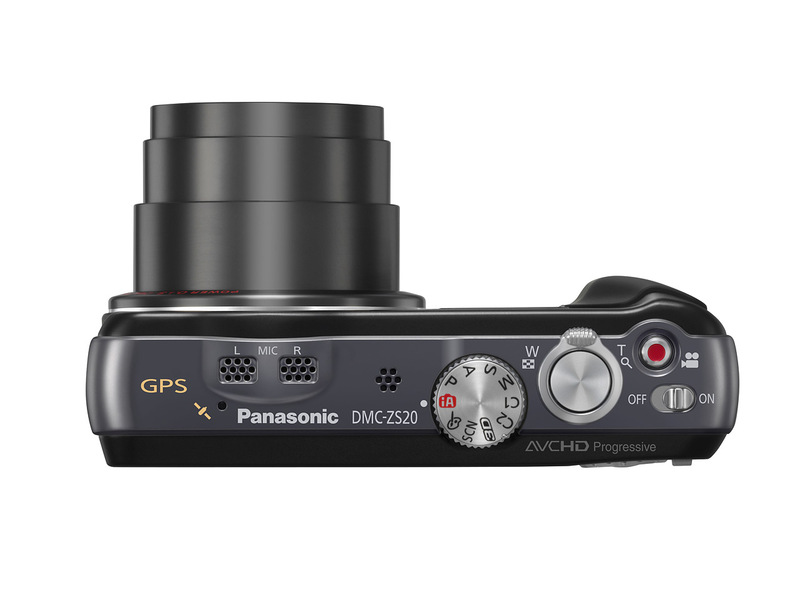 Panasonic was the manufacturer that defined what we now call the 'travel zoom' segment of the compact camera market, and its latest flagship model, the ZS20 (TZ30 in some markets) is the most advanced yet. The ZS20 offers a 20x zoom lens, covering the equivalent of 24-480mm, built-in GPS and a new 14MP MOS sensor that allows for features like high-speed 10fps burst shooting and 1080p60 video recording. 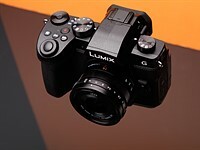 The Panasonic Lumix DMC-ZS20 packs in some great features, foremost among which is undoubtedly its 24-480mm (equivalent) zoom lens, which is Panasonic's most ambitious lens yet in the ZS/TZ series. For traveling or just everyday point-and-shoot photography, the ZS20 is hard to beat in terms of sheer versatility. If you're shooting a wedding, we wouldn't recommend relying on the ZS20 as your only camera, but for grab shots, the ability to quickly re-frame from 24mm to 480mm is extremely useful, especially in a camera that can slip into your jacket or pants pocket. 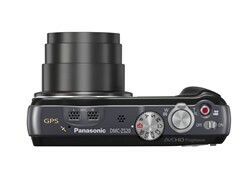 The ZS20 is a slim travel-zoom camera which features a 24-480mm (equivalent) zoom lens and built-in GPS. On the back you'll find a 3 inch LCD display with 460,000 dots and a small cluster of buttons. When we used the ZS20 we were impressed by its adaptability, but also by the effectiveness of features like its built-in GPS. While most GPS-equipped cameras just log your location, Panasonic also offers a built-in database of a million landmarks, plus maps of ninety countries. It can even show you where you are on the map, though they're not nearly detailed enough for navigation. If you don't need GPS though, you should turn it off - it will reduce battery life. The ZS20 is also capable of recording excellent video footage, up to 1080/60p, which is still relatively unusual in cameras in this class, although in video mode, the ZS20 is effectively a point-and-shoot camera. Speaking of which, we like Panasonic's iAuto mode a lot. If you have no idea how to operate a camera, just set the mode dial to iA mode, and the camera will do the rest. The ZS20 has a limited set of manual exposure controls as well, but lacks the option to shoot in Raw mode, bracket white balance or focus manually. The main strengths of the ZS20 then are its versatility and ease of use. Image quality is decent, but not outstanding. If you'd prefer better images, with fewer bells and whistles, the ZS20's 'younger brother' the ZS15, is worth a look. 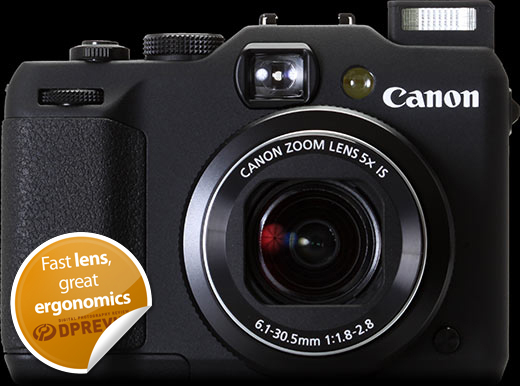 What we like: Great zoom range, responsive operation, excellent iAuto mode gets the most out of point-and-shoot photography, useful 10fps burst mode, very good built-in GPS. What we don't like: Average image quality, limited manual control, relatively low-resolution LCD screen (by the standards of the best of its competitors). The Sony Cyber-shot DSC-RX100 is an enthusiast compact camera based around a large 1" 20 MP CMOS sensor, paired with a Zeiss-branded 28-100mm equivalent F1.8-4.9 stabilized lens. The rest of its specification is pretty impressive too - a 1.2 million dot 3.0" LCD (VGA resolution but using Sony's WhiteMagic technology to offer greater brightness or improved battery life), and 1080p60 video capture or 1080i with the ability to shoot 17MP stills without interrupting movie recording. All of this in a body of roughly equivalent size to more conventional compact cameras with much smaller sensors. The RX100 is a very impressive compact camera, partly just because of the amount of technology that Sony has squeezed into it. The RX100's sensor has twice the surface area of the 2/3" EXR sensor inside the Fujifilm X10, and around three times the surface area of the 1/1.7" sensors in most other high-end compacts. The RX100 offers excellent image quality which is a step above its compact competitors in most situations, from bright sunlight to the subdued environment of a bar or concert venue. The only camera which really tops it in terms of critical image quality is Canon's PowerShot G1 X with its even-larger 1.5" sensor, but the bulky, more expensive Canon is also slower, and in some respects less pleasant to use. Despite its large 1" (13.2 x 8.8mm) sensor, the RX100 is roughly the same size as many of its small-sensored competitors. A control dial around the lens can be customized. The rear of the RX100 is home to the majority of the control points, including a direct movie shooting button and a control dial to the right of the 3" 1.2 million dot 'WhiteMagic' LCD display. As well as solid image quality for still photographs, the RX100's video specification is very impressive, and its performance is excellent. 1080/60p video recording is still pretty unusual in compact cameras and resolution is very high, and footage very smooth. Unlike some of its competitors, the RX100 also offers a useful amount of manual control in video mode. On the whole, the RX100 is a pleasure to use, too, thanks to its generous external controls and customizable Fn menu, which provides quick access to up to seven shooting parameters. Its front control dial is unusual - it moves smoothly, making it ideal for zooming or manual focus (but much less fun if you want to use it for setting discrete exposure parameters like aperture, shutter speed or exposure compensation). The RX100 isn't perfect, but we're impressed by it not only as a feat of engineering, but also by its overall performance. The larger sensor really does make a difference, placing this camera at the top of the class when it comes to image quality, and making it worth the price premium compared to some of its competitors. What we like: Excellent image quality, small, portable body, good, fast lens (at the wide end), excellent video specification and performance. What we don't like: USB charging, front control dial isn't great for setting discrete exposure parameters, flash exposures aren't completely reliable, image on rear LCD can be hard to see in bright light, lag when magnifying images in playback mode is frustrating. You base your judgements on a mistakend notion that sensor size is to be taken into account when calculating the lens speed. Consider situation when you're using XZ-2 @ISO800, f2.4, l=100mm eq. Taking the same scene with RX100 would require you to use IS3200. That's a lot of a difference, don't you think ? I haven't seen noirdesir's post you're replying to, but just reading what you've written, it's clear you're dead wrong. In order to compare cameras, you have to factor in both the sensor size and the F-number, to know which camera is faster at a given focal length. Since the RX100 has 3x the sensor area of the XZ-2, it always has a 1.6 stop advantage at any F-number. So, if both are at F2.8, the RX100 is actually 1.6 stops faster because of the larger sensor. This is what is known as equivalence. Try it experimentally: take a full-frame camera and a pinhead compact (both should be well calibrated), set both to fully manual mode, select the same ISO, same f-number, same shutter speed. Do a shot of the same scene with both cameras. You'll see the scene is exposed roughly the same - no sensor size was taken into account. Both DOF and shutter speed (exposition) are influenced by the f-number. But while for DOF calculation you have to factor-in the sensor size, shutter speed is unaffected by it. I've noticed a similar phenomenon myself. And my only explanation is that the manufacturers of small sensor cameras are tweaking the ISO values on these cameras so that you can use similar shutter speeds on the small sensor cameras as you can on the larger sensor cameras. This is just my opinion, so I'd like some feedback from others, but I see no other way for it to be. It's the total light that falls on the sensor that creates comparable pictures among different formats, not the exposure (i.e. F-number). So, IMO, ISO 100 on a small sensor camera is probably really a higher ISO value than ISO 100 on a full frame, although I'm just speculating. f-number is "the ratio of the lens's focal length to the diameter of the entrance pupil". Without going into detail (you can find it here http://en.wikipedia.org/wiki/F-number), you can notice f-number is dependent upon the focal length used. The confusion wrt sensor size is thus caused by the usage of the "equivalent focal lengths", which IMHO is a bit misleading from optics point of view. It is better to trear small sensors in term of cropping. I'm getting tired of this. Your last post really makes no sense. It's not that I don't understand it. It's just that it literally has nothing to do with what we were discussing. Your first post was unequivocally wrong however. You do in fact have to factor in the sensor size. It's the total light that hits the sensor, not the F-number, that creates equivalent pictures between formats. Nothing else that's written is going to change that fact. The fact that f-number equivalence applies only to DOF calculation and not to the shutter speed, is just plain fact in photographic optics. Anybody knowledgeable in the photooptics will confirm that. FZ200 has typical small sensor ultra-zoom picture (e.g. rubbish, just for people buying this mega-ultra-10000x-zooms) . It is not clear why it is in the list but no *Nikon P7700* or *Samsung EX2* ? 1/1.7" sensor cameras like the P7700 have literally less than 50% (actually closer to 42%) greater sensor area than 1/2.3" sensors like the FZ200. The difference is quite tiny, so I fail to understand people who think that 1/2.3" sensors like the FZ200 have "rubbish" image quality, while cameras like the P7700 come up smelling like a rose. That kind of thought process is sort of "rubbish" IMO. 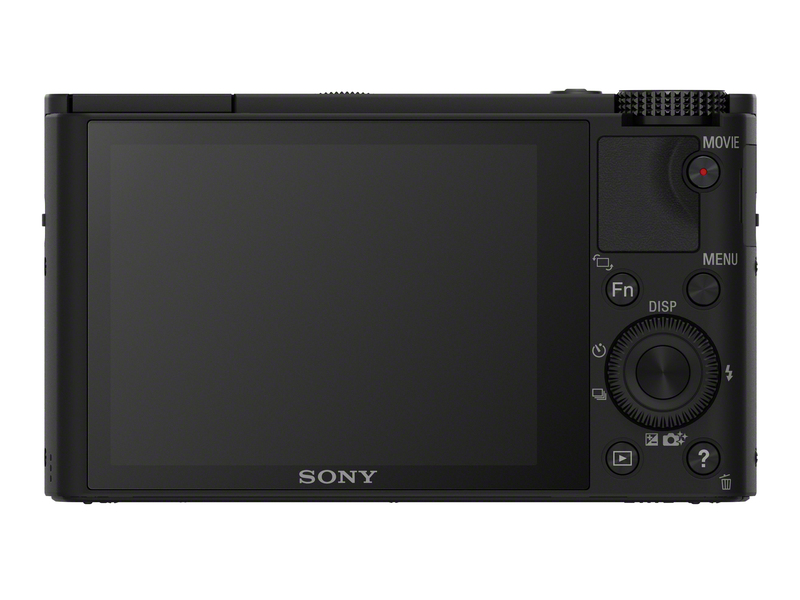 By contrast, a camera like the Sony RX100 has 3X the sensor area of 1/1.7" cameras like the P7700. Now that's a big difference. So, IMO, cameras with 1/2.3" sensors have a lot of use because they provide a lot of zoom in a small package, and their video quality is actually sometimes better than the bigger sensor cameras. I have , over the years, owned several 1/2.3" and 1/1.7" (G5, Fuji F11, G12) sensor cameras and have found the image quality to be quite signifiantly different. At 10 megapixels the 1.7" cameras have 2 to 2 1/2 time the pixel size of 1/2.3" cameras, since those cameras typically go for 14 to 16mp nowadays. Also often the lenses are better on the 1/1.7". I do believe there is a place for 1/1.7" sensor cameras and I hope cameras will opt for this size and also more cameras will have 1" sensors. I wouldn't add the G1X to the list. It is too expensive, too bulky, not bright enough (f/2.8-5.6), and slow operationally. +1 on the GRD4. Amazing camera. Flipmac, its cheaper than the rx100, smaller than the fz200, the sensor size and ISO performance makes up for the dimmer lens, and who cares if its slow? Not everyone is a sports photographer or needs to machine gun their shots. If you publish in a scientific journal you have to list your funding sources. Shall we agitate for DPreview to publish up front how much advertising income they get from various manufactures? Honi soit qui mal y pense. Why publish that before Nikon P7700 review? I just sent my TZ30 back - lousy image quality. My old TZ3 did better. aha, so this is a roundup and not a review. I learned that today after reading this article and the comments. A roundup is a comparison of 5 randomly picked items that completely differ in price , quality and specs. Yeah, it's a list of recommendations that cover a wide area, as can be expected from a holiday shopping guide. What makes you think it is random? Your inexperience? All these are great quality, though I would probably have added a Casio in there as well (lots of features to play with). The ZS20 is sticking out in this collection like a sore thumb. It's really really hard to believe that one of the "five best" compact zoom cameras in existance has "Average image quality" and only earns 75% on your own published review (a "C" in grade school). To get this kind of video quality in a dedicated camcorder, you would easily pay twice as much. To keep things in perspective, even to this day, neither Canon nor Nikon (nor Olympus, Fuji, etc.) even offer 1080/60p on any camera (or camcorder). To get video this sharp on any Canon model would cost at least $500, but you wouldn't even get the frame rate or autofocus capability, two things that Canon has yet to master at any price range. This isn't a video site, you may say. In fact, it can be anything we want it to be, and this is something I'm going to emphasize in the future, as still cameras are going to be considered video cameras as well in the future. The fact that your only understanding has to do with one aspect of the camera, while it's incredibly common here, is still a failing on your part. So, do some studying. The ZS20 is the best bargain on this list. Well, I can understand your point. But somehow I do not understand is what you need 1080/60p for. Where you present and what you do with your videos, that you have need for this format. This is cam. for home - non professional usage. My experience is, that most of times videos from this cameras are getting downgraded or played on TV sets (which are not calibrated). One could argue the same thing about most peoples' obsession with minutia regarding still images on this forum. Let's face facts, most of the things that people are arguing about amount to little more than minutia. My point was that the difference in video between the Panasonic ZS20 and the Canon SX260 is actually far greater than the difference in stills, which is pretty small. 1080/60p has far more utility than the lower frame rates, as I'll explain later. But, more importantly, it's something that both Panny and Sony use to differentiate their cameras with high end video capability. IOW, it's not as much the actual frame rate as the fact that 1080/60p is something, that as of 2012, Panny only reserves for their high end video capable still cameras and camcorders. Now, regarding the actual utility of 1080/60p. Simply stated, it provides smoother, more natural and lifelike motion than 30p or 60i. It's usually sharper than lower frame rates and it allows for slow motion. 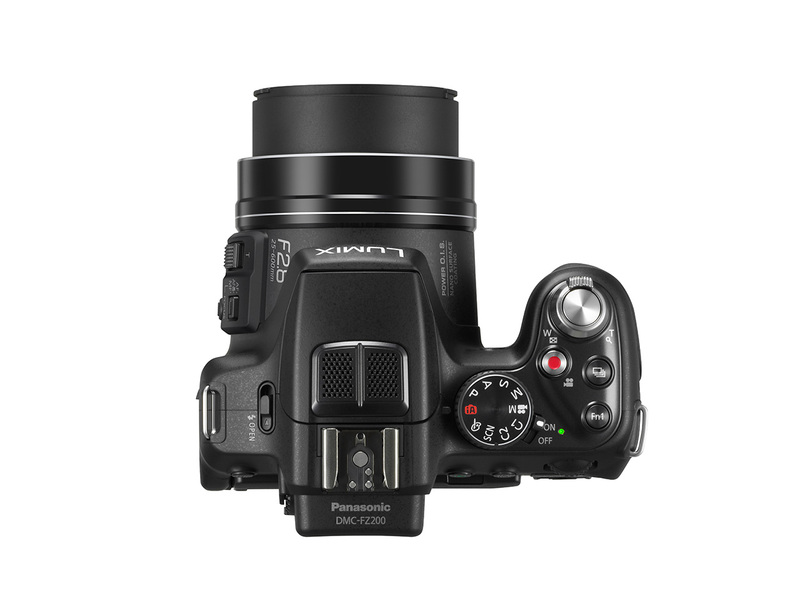 Have you used a Panasonic ZS camera? IMHO, most of these modern cameras, even the "bad" ones, are overkill as far as IQ goes, for printing at 8x10, which, let's face it, is where most of us max out. If you regularly print at 20x30" or something like that, OK, I understand the argument. So what we're interested in are FEATURES, ease of use, fantastic zooms, etc. It was no different in the film days. If you bought a $3,000 camera, you weren't paying for a better "sensor" (film). Nope, same film as everybody else, same lenses too. What you got was features, which people have always been willing to pay for. Easy, for sharing vacation movies with family on a 80" projection screen. You should try it. It's a riot. Hi - end video starts at 2500Eur+. I guess with cameras you talk about you are nowhere near. Sharpness does not come only from fps, but from lenses and readout of sensor. For real slow motion you need cca 200fps. Nowadays semi pro and pro high speed cameras are at cca 500fps and up. 80" is 2 meters. I use HD at professional use at 4x3m + and another (also unusual formats) For size you need resolution. It depends more on sensor and quality of lens than on fps. -thanks for pointing overkill at IQ. I guess 3000 bugs you get better lenses though, better - bigger sensor and image processing (in still as well as in video) and features - which you know by that time how to use. The art of getting the most out of low light conditions has been lost. In the days before digital I had a cheap East European camera that used either 100, 200 or 400 ISO film. That was it. I took numerous night and low light shots and many of them were more atmospheric than I could do today on some digital compacts. Why expect 1600 ISO in small compacts to produce decent IQ? Try restricting to 400 ISO max and make other adjustments - it's a challenge! I'd hardly call that little dark tunnel on the Canon G series cameras a Viewfinder. The Nikon P7700 is already selling really well and getting fantastic reviews (4 1/2 Stars on PhotographyBlog). IQ wise it beats the G15 rather easily, and the tilt-swivel LCD is one of the few reasons to buy a compact as large as these two. Unfortunately it's gone on the G15. Without it, might as well carry an S110, RX100 or XF1 and get a camera you can actually pocket. @marike6 - Spoken just like a person who has never used the G15 .. . nor the P7700. Quite obviously marike6 is just a fanboy. P7700 have no chance? I'd guess that an extremely small percentage of people actually use viewfinders on these cameras. I don't even like the tiny viewfinder on my 50D! The advantage of the LCD and especially one that tilts, is not to be underestimated. It has nothing to do with fanboyism. Just check the DPR comparison tool for G15 vs P7700, or download some full-size files from both. Files are similar, but the P7700 JPEG engine and high ISO ability is better. That said, both have very good to excellent IQ. Right! Nikon makes high quality system cameras but not compacts. Best compacts are of Canon. Cheers. "Best compacts are of Canon." You are totally wrong, WORST compact are of Canon, of all manufacturers. They have slowest frame rates (see 2fps G15 vs 8fps P7700 vs 10 fps Sony vs 12 fps Panasonic). Because their processors are slow. An for the same reason, they are slow to autofocus. What camera is "this camera"? Today I went out and bought a TZ30 which I thought was clearly an upgrade from my old TZ8 I have carried and used all over the world. Not so – I must surely hold the all-time record – my ownership of the TZ30 from purchase to return was just 39 minutes. I was absolutely disgusted when I opened the box and saw that the charger was linked via USB cord directly to the camera. It does NOT have a dedicated battery holder linked independently to the charger. For a TRAVEL camera, I want to carry a second battery and I normally set out in the morning with a fresh battery and leave my second battery on charge in the hotel room or wherever. On my return I can swop if need be as by now the second battery is fully charged. So I will have my camera with me 24/7. But not so with the TZ30 – one has to leave the camera unattended whist plugged in to charge the battery – just how dumb can you get????? For a TRAVEL camera, it gets a FULL ZERO for having one of the dumbest features of all time. These are all nice cameras but I can't believe that the Sony, at $650 has no provision or bracket for an outboard flash. That's a deal breaker for me. It is when you look at a print ( yeah that old thing ) 50 by 24 inches that has been produced from RX100 images on ISO 3200, that you understand this camera is in a serious class of its own. It should get a score of zero in its own class because there are no other cameras like it. Sorry...not carrying on about the scoring system again. Dashing off 50 x 24 inch prints, of ISO 3200 captures, is something that most of us do every day. I feel stupid now for having valued other features of these compact cameras, like edge-to-edge sharpness of the lens, maximum aperture, exterior controls, etc. That's why this web site is so cool. Guys like me, who are totally lost, get to learn from guys like you, that we should be valuing first and foremost in a compact camera the ability to print at 50 x 24 inches from ISO 3200 captures. Thank you so very much for your advice, my well-intentioned friend!! I don't print anything larger than 8x10, which is why I decided to sell my K5 and lenses. I would ask though, since you have decided the RX100 is in a "calass of its own," if you have seen any 50x24 images printed from the other cameras in this round up? If not, how did you come to your conclusion and expect it to be valid? A printed image reflects the incident light. Whatever ambient light that may be. When you show someone a printed photograph, the light that is reflected from the surface of the paper is the light that washes the whole space. It does not emit photons like your Ipad or computer monitor. It is fixed in the way it shows its colour attributes. A B&W photo viewed in a dark room is different from viewing it under very bright light. That is why I like printed images. I dont know if i can believe the 50x24 print at iso3200....I mean sure you CAN do it....I can print a 100x50 inch print with my XZ-1 at iso6400.....it will look horrible....but yep...i can do it. Bob, you nailed. I feel like a pathetic looser with my s95. "Dashing off 50 x 24 inch prints, of ISO 3200 captures, is something that most of us do every day." --------------- correct we do not do it. Thats why everyone of us would be good with cell phones. But you see we spend tons of money on cameras and this we also include you too.
" Image quality is decent, but not outstanding. If you'd prefer better images, with fewer bells and whistles, the ZS20's 'younger brother' the ZS15, is worth a look. " What on earth is a camera with an inferior image quality to its "younger brother" doing in a recommended list of cameras?? Or have we got to the state where "bells and whistles" matter more than IQ? I bought the ZS15 because it has the same, much praised, sensor as the FZ150 and the IQ of the ZS20 was known to be rubbish. Come on Dpreview, you can do better than this. I bought the ZS20 several months ago. And, guess what, at the time, I fully knew of the supposed image quality advantage of the ZS15 when I bought it. If I had it to do over again, I would choose the ZS20 any day of the week over the ZS15. And here's why. The problem with this forum has always been a fixation on one aspect of the camera to the exclusion of all else. The ZS20 actually has as good or better video quality than any of my dedicated camcorders. It's 1080/60p video is as sharp as any single sensor camera on the market today. The ZS15 only has 1080/60i, and it's nowhere near as good. The ZS20 has a longer reach than the ZS15 and probably a better LCD as well. So, the ZS15 provides a slight advantage in still image quality. This isn't the be all and end all of what makes a good camera. The ZS20 is very competent with outdoor stills. The ZS15's advantage is just that, slight. And the ZS20 is the better overall performer. The ZS15 is a very nice camera as well, BTW. Sorry but the whole point of a camera is image quality, everything is second to that. If the upgrade is infact a down grade then the world is spinning in the wrong direction and the accountants have won. leno, I agree and disagree. But something you've failed to understand from my post is that the ZS20 DOES in fact have better image quality than the ZS15. In 2012, there are two relevant types of image quality, stills and video. This is a distinction I made in my post, but you failed to make in yours. This is a trend in DPReview that's eventually going to have to change as cameras become more all-in-one tools. My point was that the ZS20's advantage in video IQ over the ZS15 is greater than the ZS15's advantage in stills IQ over the ZS20. Aside from that, if I had a choice between a 5x camera with a 1/2.3" sensor with a very good stills IQ for its class (which by definition will never compete with a larger sensor camera) and a 20x zoom with a slightly lower stills IQ, I would take the 20x camera. And here's why. A 1/2.3" sensor is never going to provide stellar stills quality. In this class of camera the greater zoom is more useful than a tiny increase in stills IQ. @leno IQ would seem a logical choice for 1st priority (i.e. "everything is second to that"). But consider a moment, before you even talk about IQ, there has to be an I worthy of the Q. So for me, ergonomics (basically the human/camera interface) and performance (responsiveness of the camera to the interface) - and most especially the viewfinder - are the most important factors. I would far rather capture the moment, perfectly composed and timed, and suffer a slight loss of IQ, than to have a pixel-perfect capture of the wrong moment, poorly composed. To put that in context, I find the biggest advantage of FF over crop is not to do with IQ (although the improvements are welcome, of course). I find the biggest advantage is that finally I can actually see what is going on in the viewfinder! The improvements I see in my pictures are first and foremost better composition and timing. wetsleet has got it exactly right, I think. The whole point of a camera is taking pictures, and if it makes it difficult or frustrating to do so, then it's not a very good camera. Of course, ergonomics is subjective, so there is no such thing as a camera that is "the best" for every user. Revenant, as I keep reminding people, the world is a different place than it was 10 years ago. Unfortunately, the mentality on this forum is stuck in the past decade, something that needs to be corrected. Between video and stills, if one were to become obsolete a decade or two from now, it sure wouldn't be video. Once 4K and 8K video come around, do you think the average consumer is going to be content just taking a single snapshot? The whole point of a camera in 2012 is not just taking pictures. With video quality better than most dedicated camcorders, people could easily buy the ZS20 just as a video camera and still have gotten a bargain. My suggestion to most of you people would be to actually do some studying beyond your own little world. The ZS20 is really a far better all around camera than anything Canon is even capable of putting out. I've put it to great use for videos and stills. I agree with wetslet and Revenant. I would however like to add the following on the subject of the viewfinder: for me it is not ***only*** a matter of ***seeing well*** in a viewfinder what exactly I am photographing. For me it is also important to ***enjoy *** at the time of the picture-taking what exactly I am photographing. You didn't get my point. I didn't talk about stills vs. video, but about ergonomics vs. image quality (or video quality, if you like), as a response to leno's statement that "the whole point of a camera is image quality, everything is second to that." My point was that if a camera gets in your way, in terms of ergonomics or user interface, then it's not that great a photographic (or videographic) tool. So for me, ergonomics is at least as important as the quality of the camera's output. Image quality is not the prime consideration for me, or indeed anyone shooting things other than still life, architecture etc. What must matter first, is getting the shot. If a camera is so slow in operation or has a UI that is so poor you miss the shot altogether then all the image quality in the world is meaningless. Nice work DPR should be very helpful for newbies and not so newbies considering a new compact. Not so nice in fact. The recommendations of G15 and TZ30 is deceptive and WILL hurt the buyer compared to some better alternatives. Putting XZ-2 as an equal (and even in front of) RX100 is also deceptive, especially given very similar prices. And NOT recommending the clear best camera for beach vacations/active sports - Olympus TG-1 - is not helpful either as many people primarily use their cameras in these contexts. Bravo DPR on going straight to the article from the main page rather than having a useless buffer page! It looks like "compact" is being used to mean "fixed lens". It actually says what they mean at the beginning of the article - "by 'zoom-compact camera', we mean cameras with non-interchangeable zoom lenses, regardless of size." Looks like some people didn't read the article before they complained, no surprise there. These are all very good fixed zoom lens cameras for their categories. There are also a lot of other good, fixed zoom lens cameras out there. If you don't like the list, write your own review. This is a horrible review. A $249-649 price range? All shoot RAW but one? The FZ200 is a "compact?" Where is the LX7, S100, and a few others? Where are the image samples? I think this is a waste. @Sothoth - so you dismissed it immediately and moved on to something else? DPReview said in response to an earlier comment on page 1 that LX7 "didn't make the cut." 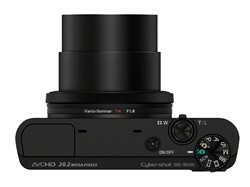 I am surprised too - as also by the choice of TZ30 over Sony HX20V in the travel zoom category. IMHO DPR could have at least explained why they left out these and other very worthy contenders like G1 X, X10, S100 etc. @Neo, I'm not sure I get your point. @Kerry - I didn't dismiss it. I looked at all the cameras they recommend and researched them a bit. Nothing wrong with any of them but surely not fitting of DPRs usual high standards. If it were me I'd divide the review into three categories to compare the compact zoom in the $300 price range separate from the high end compacts that shoot raw and have reasonably good optics (G15, LX7, etc) and had a category for fixed lens that aren't so compact. I'd have shown sample images and compared ergonomics and controls, and described what it's like to use each for a week or two, rather than superficial "here's the best" when the pool is too broad to really be useful as a comparison. Just seems lacking to me. @Sothoth - You said "horrible review". First of all, this is NOT a review. It's a ROUND UP. And they chose five different cameras, from different compact categories (advanced, superzoom, travelzoom, pocketable). Thus the price range goes from $250 to $650. Also they've stated that 'compact = non interchangeable lens camera'. So, your comment was kinda unnecessary, since it was all very clearly explained in the text itself. Unless you were just trolling around on purpose. Actually, I think this round-up is excellent, and I was one of the first people to say so when it was first published a few days ago. If you go back and read my early posts, I explain why. I also explain why I had to take a few days off from this forum after all the incessant and unrelenting whining over the FZ200 not being a compact (when it is in fact classified as a compact). To summarize, I think this round-up is spot on. Have you noticed that these are from different makers? As if Sony couldn't have the best travel zoom and enthusiast cameras. This article is a pity. Hmm. Not sure stating an opinion on a forum makes anyone a troll, but I certainly respect opinions contrary to my own. It's indeed my opinion that this "round up" leaves a lot to be desired. Regardless of the classification of a camera as "compact" it seems hard to imagine most users thinking of that one as compact. Also, stating in the text why you are comparing things with such a wide range of price and functionality doesn't get anyone off the hook for a bad round up, it makes we wish they had gone into more depth for each category. It's my strong and humble opinion that the round up is fairly useless to me. Barney-Did the Brits get as put out by the BBC scandal as much as they seem to be over your piece?Yikes!I thought you gents were more civil though it's prolly American and Aussies that are so excised over it.Thanks for your insightful,informative writing. For Canon $1 = £1? We Brits are ripped off by Canon. Why specifically Canon. From what I remember the Nikon P7700 started at a higher £ figure than the $ figure. I have never noticed that this is a feature of any specific manufacturer. They all seem to try it on for pre-orders and early take up. The XZ-2 seems to be at a more reasonable price but they seem to be arriving a bit late for the party. Right now in the UK the G15 is more expensive than the RX100. Makes the RX100 a no-brainer choice really. And as for the price comparisons, they are largely explained by VAT and import duties. No tkbslc, they are most definitely NOT explained largely by VAT and import duties. Unless you think that the Sony RX100 is subject to different VAT and import duties than the G15!! 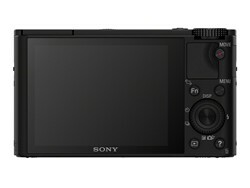 RX100 $649/£443. What does that tell you? That even with VAT and import duties, one can sell a camera in the UK at 443/649= 68% of its $ price. I wish people wouldn't be that lazy and just assume that "it must be the VAT..." when the arithmetics are simple and prove it's not. I wonder what is the percentage of compact camera users that use an external flash. I bet it's a very small minority. Viewfinder? If the G15 had a proper viewfinder then I'd agree with you that it's important. But I like to carefully frame my photos to start with and the G15 viewfinder is grossly inaccurate. What was its frame coverage again? Right. More zoom range? Hardly. If you take into account the RX100 extra magnification due to its almost double resolution, you get to around 130mm equivalent tele at 12 MP. So the G15 has an extra 10mm. Big deal. Better manual controls and grip? That's subjective my friend. I've handled the RX100 and found very little wrong with it. Faster aperture? Try to be accurate: only when you zoom in. At the wide end where the majority of people shoot the majority of their photos, they are equally bright. But I'll give you that, the G15 has a slight edge there. RX100 is a refined product with better IQ + cheaper than G15 = no brainer. good article but where i can find a similar collective article for Nikon Coolpix cameras ? I think you guys would only be happy if they made a list that just has every half-decent camera from the past 5 years tied for first place. No, they wouldn't be happy, because many of the complainers work for the different camera companies, so if you included the P7700, for example, the Nikon guys would complain about the inclusion of all the OTHER companies' cameras, and so on down the line. It's DPR's selection. Who cares? G15, great ergonomics? It was a bit of disappointment for me. P7700 is a lot better in this point. @Altruisto. I couldn't disagree more. I tried both extensively as well before buying my G15. In fact, I was set on the P7700 until I tried them both side-by-side. The P7700 felt clumsy, large and slow to me. The G15 feels snappy, solid and just makes me want to go out and take pictures. If you look at my Flickr stream, you'll see that the camera is more than capable of sharp pictures and excellent IQ ;-). To each his/her own, though. Quoting Barney on the full review of the FZ200, leave me to believe DPR have either made a categorical error with its inclusion here , or its deliberately provocative choice. It's not just about IQ. A big part of the reason why the FZ200 got such a good score (and bear in mind that scoring is relative to product category, and the P7700 is in a different one) is that it has an excellent lens, is nice and quick, handles really well, and offers Raw mode. "By 'zoom compact camera', we mean cameras with non-interchangeable zoom lenses, regardless of size." Enthusiast compacts, travel zooms and super zooms/bridge cams are all "zoom compact cameras", so no error has been made. I guess they wanted to include something for every taste. In case of superzooms I think X 5 would be a better choice - in terms of pics quality as well as price - performance point. It says from point and shoot to hi end raw capturing cameras, so I do not think Raw is condition, therefor should qualify. Nevertheless, despite my grumbling I think its a good editorial call, as it has challenged my own view of what i may actually be looking for, I went to look at one and in store and did a speed read of the full review. But decided that what I mean as compact is a jacket pocketable, discrete and folds flatfish. You must be literally the hundredth guy here who is confused about terminology that, instead of actually looking up the definition of "compact camera", has to come here and literally pollute this topic with misinformation. For the hundredth time, the FZ200 is as much of a compact as the ZS20. The term has nothing to do with the actual physical size of the camera, but with the fact that it's a fixed lens, small sensor camera. Even Panasonic, on their site, classifies it as a compact. And I fail to understand why this is so difficult for some people to comprehend. The FZ200 in fact has the best lens of any bridge camera to date. And, bridge cameras being considered compacts, it's inclusion is entirely appropriate. Here are some other facts about this camera. It has some of the best video quality of any stills camera on the market today. It has among the fastest autofocus and speediest operation of any bridge camera. Yes, it's an oxymoron, but only if you take "compact camera" to literally mean "a camera that is compact". In fact, "compact camera" is widely used as a label for "cameras with a fixed lens", as opposed to "system cameras", which have interchangeable lenses. Most languages are full of expressions that doesn't make sense if you take them literally. The point is worthy of debate, but i am OK with the choices DPR make its there publication, Whist there is a comments section i feel quite happy to pollute it with my opinions, and will continue to do so. Just came back from the camera shop, and while there I handled the G15 and the RX100. The RX100 feels so much more refined than the G15, but I guess manual shooting with the G15 might be easier (I liked the exposure changing thumb wheel a lot!). The ring around the lens was very stiff, and hard to set exactly, though. The XZ-2 was unavailable, but I own a XZ-1, so I know the feel of it. I find the Xz-1 to be a good one-hand camera (in good lighting), and the UW housing you can buy for it is superb (I mount my 77mm close-up lens in the housing - works perfect, even on land)! Looking forward to the full review! I can note the absence of two fondamental competitors: nikon P7700 and fuji X-S1. I wonder which is the point of this comparison, most of this cameras have already been reviewed separately on this pages. This is NOT a comparison. It's a round up. For people wanting a compact camera within a range of categories (advanced compact, travel zoom, super zoom and such). P7700 was mentioned in the Canon G15 writeup. 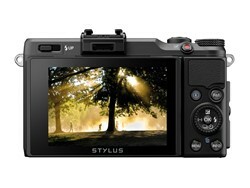 The P7700 does not have an optical viewfinder which is a big deal breaker for some myself included. The Fuji X-S1 though on paper a really nice camera had a rough start with sensor issues. I think that Dpreview should have added a final paragraph to some honourable mention cameras like Panasonic LX7 and Nikon P7700? Would not these rank as cameras many would consider as near the top performers? I know they are only listing their choices of top 5 but some of us like or would consider a few cameras not mentioned. The issue of omitting the P7700 is contentious. In looking for a replacement for my aging G7, I much prefer to articulating screen and longer zoom of the P7700. You can't get these two features without foregoing size. I've seen nothing to suggest that the P7700 is otherwise inferior to the G15. I'm not bothered by the fact that the G15 is a bit faster at the short end (f1.8 vs. f2.0), and a bit faster at 140mm (f2.8 vs. f3.5). Between 140mm and 200mm, I can take a shot with the Nikon, but not the Canon. So as far as the G15 vs. P7700 debate goes, the G15 recommendation is purely based on the reviewer's perception of what's better (smaller body, slightly faster lens at equivalent focal lengths) and little to do with functionality that the user night actually need. I guess that's why I like sites like this. They don't just say here's the current cameras . . . they also list the specs. The problem is, if you don't know cameras and how different things can affect the shots you get, where do you start? The comment section used to be a great place for constructive and insightful comments. Now it has become a place for whiners and harsh criticism. No review is going to please everybody and everything is up for debate. But why are these people wasting their time writing bashful destructive comments about the authors? Negative comments are pointless and are not adding anything to the discussion. While I'm agreeing with you up to a point, who taught you that negative comments are pointless? You think everything's perfect and there's no room for improvement? If everybody just says positives things or nothing at all, you're not really helping improve what can be improved. Sure many people here are overstepping the line of constructive criticism, but saying that negative comments are pointless is quite wrong. I am sure the lists like the one above are created to stimulate the comments. All the list above says is that if you spend an enormous amount on a compact it will be better than a cheap one but IMHO you are very much into the realm of diminishing returns. My favourite little compact at the moment is a 230 Ixus which is actually compact and cost a fraction of what the cameras above cost, especially here in the UK where often £1 = $1, and gives results not a lot different to the above cameras with a bit of work. Sorry if I am so critical but it is difficult to take this seriously. I bought a XZ-1 and a P7100 to go compact but they were just nowhere as good as my Samsung NX100 and just not worth the money. I am not against compact cameras but think these high end cameras represent very poor value for money and squander the size advantage the small sensor gives. Right Nightwings. But hey, even us need to get out more:) If fact I'm going out right now! I don't mind intelligent negative comments, is the trolling angry curmudgeon comments I can't take. @YiannisPP - to continue your train of thought, who taught you that focussing on the negative is the best way to secure improvement? Educators and parents will tell you that the best way to get improvement is to focus praise on the good aspects, and do your best to ignore the negative aspects. Human nature, unfortunately, is often to do the exact opposite. Just as we ignore our children whilst they are being good (peace at last! ), and give them our undivided attention when they are being bad, so we tend to criticise what we dislike in an article and overlook the rest. Put yourselves in the place of the author - the best he can then hope for is a perfect article which nobody comments on! Some incentive. "If everybody just says positives things or nothing at all, you're not really helping improve what can be improved" - actually sticking to the positives and ignoring the rest is usually the quickest way to secure improvement. Wetsleet, with all due respect, I think you're making a mistake here. What you're saying is true, for children, not adults! We're not "educators" of Lars and co here. We are presumably mostly adults and as such we should be able to take criticism without throwing our toys out of the pram. But in reality many adults are very insecure too and if you dare criticize one particular thing they've done or said, they take it as if you're insulting their whole being. By the way, I never said we should focus on the negatives only, did I? I will admit though that I mostly comment when I think something is wrong or not fair. But this is because I take it for granted that DPR know cameras a lot better than me, I feel no need to comment on a round-up praising them. It's their job and we are indirectly paying them by frequenting this site. Of course you are right - we are adults and as such should be better able than children to respond positively to constructive criticism. Even so, I'm sure most of us cherish hearing 'wow, I thought that was really great, how you did xyz', especially when it is meant sincerely by someone we respect. Trouble is, we so seldom do hear it. But giving that kind of constructive praise is far more likely to result in more of the desired behaviour than would be achieved by constructive criticism. The thing is, especially as adults, we can work it out for ourselves - the bits that didn't rate a mention of constructive praise are probably the not so good bits - you don't usually need to point it out. And the feel-good imbued by the praise is generally a much stronger incentive to do more of the good, and by default less of the bad. And finally, there are always loads of people offering the criticisms of the not-so-good aspects anyway - rest assured that job won't go undone. The praise, however? So, even after they've stated clearly on the article that "compact = non-interchangeable lens camera" there are STILL (many) people complaining about it? Oh, the humanity! The argument that you cannot put compact cars in your pocket could better be described as a specious one. I still find it difficult to associate the meaning of the word compact in the normal useage of the English language with my heavy , large and cumbersome SX40 which is a similar size and weight to the FZ200 but at least has a long zoom. Photography seems to have turned the word into something entirely different which has nothing to do with size apparently. I would describe the SX20 as compact as that was very nice to handle but the current crop of bloated bridge cameras seem anything but. As compact as a cane toad methinks. The irony is you can get cameras with the same amount of zoom as the FZ200 which you can put in your pockets. I'm not discounting everything you say, but I think that the word compact is used in everyday use just as it's used in the article here. I like the car analogy. You are right, though, that many people will think that "compact" = "pocketable". For me to get the same range that you get with your SX40, or that the FZ200 has, I have to pack my GH2 and at least three lenses, let's say the 70-300mm Oly 4/3 (probably bigger and heavier than the SX40 all by itself), the 14-42 kit lens, and the 40-150 Oly 4/3. I'd also need an adapter. So to me, the SX40, SX50, FZ150, and FZ200 are quite compact, and I've wanted one for a long time for just that reason! I do a lot of hiking, and throwing any of those cameras in the backpack instead of a whole system, and getting reasonable image quality and video, would be cool. @neo_nights/bobbarber. True enough and the Z200 aperture is impressive and I would actually swap my SX40 for one. It is just a silly issue over terminology. They say below have actually edited the description to clarify their intentions. It is all good fun and only words so enjoy your cameras whatever they are. I bought the FZ200 a few weeks ago and love it, great camera. I was going to also add a high end DSLR Nikon or Canon to my collection but with this camera i am going to hold off for now. I wonder why nobody seems to feel that the lack of a viewfinder is something to not like. Especially with travel zooms reaching up to 480 mm (eq.) or more, I cannot believe even half-serious telephoto shooting is possible at all; without a finder it is already improbable to even, well, /find/ a subject like, say, a bird in a tree. I agree with you - I need a viewfinder in my sunny neck of the woods ! In a bright sunny part of the world a viewfinder is a great asset -that was the prime reason I bought a FUJI X10. I agree, as much as the little Sony is a fantastic instrument for recording am image, I find the ergonomics horrible. I third this idea. The crummy little OVF on my Olympus C7070 was a Godsend many times. When I got into m43, I went with the Panny bodies instead of the Oly bodies, because the EVF was included with the camera. It simply is not an option for me to not have an OVF or EVF (screen doesn't count) on a quality camera, especially a $600+ (yikes!) camera. Agree, I have a problem with cameras without viewfinder. That's the only thing I have against the RX100 is the total lack of viewfinder, while I know the XZ-2 can be equipped with a superb VF-2 viewfinder, and the G15 has one built-in (not the best, but it is included in the design). One of the Panasonics have one, not the other ;-(! Sony knew the RX100 would sell just on the 1" sensor so there really was no need to add anything else. Hopefully they will continue the concept and better specified cameras will follow. As regards the VF-2 do a search in DPR 'vf2 rubber band' before buying one. The VF-3 is cheaper, locks in position and is perfectly adequate even if not as good optically as the VF-2. F6.5 vs f2.8. End of story. Compare ISO 1600 on the Canon to ISO 320 on the Panasonic and see how that turns out. The f2.8 aperture through all zoom ranges is great on this camera, compensates for the smaller sensor. I have been taking pics the last few weeks with it and am getting familair with all the controls. I viewed these pics on my 52" TV and they were incredible with the right settings. Yeah, honestly I think the Samsung WB-850F deserves a spot on the list more than the Panasonic super zoom. I've played around with it quite a bit, and aside from having a wider-angle lens on one side and 21x zoom, there are a few features I really did enjoy (sony-style pan-to-panorama, emailing photos right out of the thing, wifi tethering). Just a thought, but it seemed pretty much on par with the Canon superzoom at the time (SX260?) if not a cut above. Never did really try it in low light, though, and I know the Canons tend to stand above a little in that respect. Have to say, though, I am glad that sh!tty Coolpix attempt at it never made the list. The ZS20 and FZ200 are odd choices here, regardless of how good they are. For sure all good cameras one can recommend but very buyest. How come they call it compact class and include a super zoom? nothing compact there. New real compact have hit the market and should be included but of cause dep. runs behind or even ignore them in some cases. DPReview use definition 1, you want to use definition 2. Po-tay-to, po-tah-to. 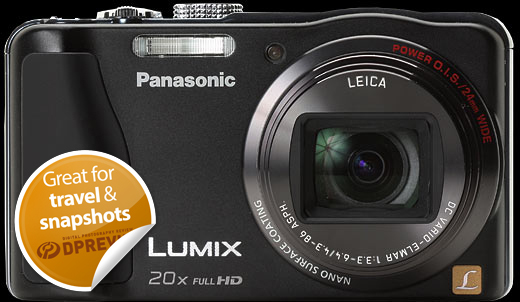 Why is the Lumix DMC-FZ200 (which is probably an excellent camera) with its dimensions included in the list of the "Top 5 Compact Cameras"? I was thinking that such cameras where part of what is often called "Super Zoom" camera category. Anymore if it is not a camera with a changeable lens, it's a "compact". It's all relevant isn't it. There are such things as 'compact' cars, yet no one's slipping one of those in a pocket either. I'd suggest a camera with a 25-600mm equiv f/2.8 constant aperture lens such as the FZ200 is the very definition of compact when evaluated fairly against its contemporaries. Just consider that most of us with the ability to reason are not having an issue with the definition of compact camera, here. Go ahead and chase your tail all afternoon if you wish. Absolutely disagree with such camera choice. Fuji X-10, Leica X-2, Sony Nex-7 (it have size of compact) are the best compact cameras. Leica X-2: No zoom lens. Fuji X10 could definitely win worst looking camera but i guess if it takes good pics who cares. Why doesn't everyone cry some more? All the cameras on this list are excellent picks, even if you think there is a better one. And unlike all of you, Dpreview has actually used all of these cameras and likely the alternatives being suggested, so I think they might have basis for a more well rounded opinion. But, regardless, this is an opinion list, not a fact list. So lighten up, it's the holidays! The list is not a scientific fact and it can't certainly make everyone happy. Why some people have to be so rude. I really appreciate their hard works. And no, I don't work for Amazon. I would add the Canon G1X to the list. It is not much different in size to the G15, has a good lens, larger sensor than any camera in this group, and takes phenomenal pictures. I took the G1X and RX100 on a recent trip to Spain, and came back thinking...who needs a DSLR anymore. I believe 2013 will be more difficult to choose. as the camera manufacturer start to learn that buyer want good Image quality on the cameras they want to buy. mostly will give fast lens I believe. I think 3enson, you have a narrow field of view,People are doing their best here. This is my favorite site so please don't take this the wrong way. I find it difficult to understand why you recommend the XZ-2 which you have not reviewed over, say the Nikon P7700 which has the same size sensor and a 7x zoom. I also find equally difficult to understand how a camera like Canon's G15 (I own a Canon G1 and a 40D, so I'm not anti Canon!) which came out almost one month after the P7700 gets fast tracked into reviews and recommendations. 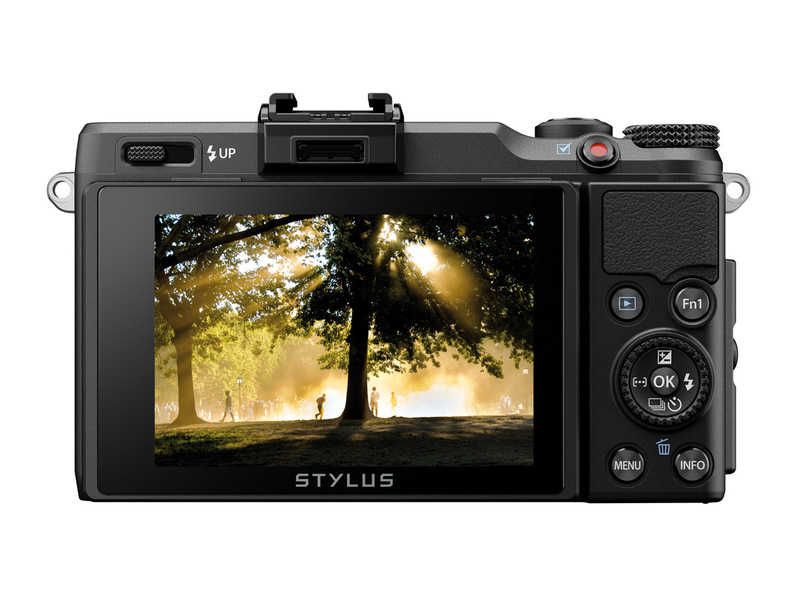 The LX7 simply fell through the cracks (between the RX100 and XZ-2), as did the two Fujis (X10 and XF-1). Sony. What you don't like should include ..no viewfinder and no option to fit one, you say yourselves that the screen is difficult to see in poor light. How much would it have cost Sony to add a slot to plug in an additional EVF,as found on the Olympus and the Panasonic LX 7 ? The RX100 doesn't even have a doggone shoe which would enable you to use an optical finder! I bought a $3 shoe which I'll ask Nippon Camera Repair here in Manhattan to fasten to the top of the camera, even though I could probably do it myself with insane glue. From all these cameras on the article I have no doubts. 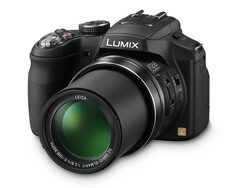 The Panasonic Lumix FZ 200 is the one for me. But it is strange to see Dpreview including the FZ200 like a compact camera. I wonder why the Panasonic Lumix LX7 is not included here. It is a great camera. I think Samsung EX2 is worth to mention (at least). It has f 1.4 lens - fastest in compact market, ND filter and very good image quality. Menu might be odd, but its serious compact. I miss G1X and P 7700.
good point. Did not realize that LX 7 is faster on long end. Thanks for correction. Interesting comparison. I don't know if I'd place them in the same order, but I'd certainly pick the G15 before the other four, so it is definitely the "winner" even in my book. They're in alphabetical order (and are not considered directly comparable). Where is the Lumix DMC-LX7? 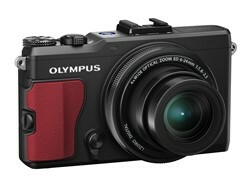 Does anybody know when the Oly XZ-2 is supposed to start shipping in the US? I initially heard late October but can't find a firm ship date for the camera now. It looks like Olympus XZ-2 announcement has been rushed as the new spate of fast aperture cameras being released has really taken the wind out of its sails. It has finally put a decent image and video engine behind the excellent lens but is all a bit too late.